Russia and the United States signed a pact on Tuesday allowing the world’s two largest former nuclear foes to boost their nuclear trade and apparently work on new ways to prevent the proliferation of nuclear weapons via a uranium fuel “bank” on the eve of new Russian President Dmitry Medvedev’s inauguration. Russia and the United States control the largest arsenals of nuclear weapons in the world and both have ambitious plans to build hundreds of new reactors for power production – which both nations explain as their preferred method of combating the rise of greenhouse gasses, a point of view that Bellona strongly challenges. Russia, one of the world’s biggest sellers of enrichment services, has been trying to break into the nuclear markets of the United States and the European Union to compete with giants like Eurodif, Urenco and the United States’ USEC. Kurdik noted that in 2002, the year following the Kremlin’s go ahead for Russia to accept spent nuclear fuel from abroad, the lack of a civilian nuclear agreement between the US and Russia was the main impediment to the United States sending spent nuclear waste to Russia. Russia projected at the time that it could make $20 billion on accepting foreign spent nuclear fuel for reprocessing, but figures have fallen well short of projections. “The United States has fuel stored in Asian countries. And they may now be interested in storing it in one single location, namely, the Russian Federation,” said Kudrik. The new civilian nuclear cooperation deal will open up the booming US nuclear market and Russia’s vast uranium fields to firms from both countries by removing Cold War restrictions that prevented bilateral trade potentially worth billions of dollars. The deal was largely made possible by a decision of a US trade court decisions torpedoing anti-dumping measures that have blocked Russia’s exports of uranium to the United States – except for those covered by the 1993 Megatons to Megawatts agreement, which ships down blending highly enriched uranium (HEU) to low enriched uranium (LEU) for use in US commercial reactors. At present, fuel arriving in the United States under the Megatons to Megawatts programme, which is set to expire in 2013, power 40 percent of US reactors. The new commercial deal will somewhat scuttle the nonproliferation agreement that has been in force since 1993. Outgoing US ambassador to Russia, William Burns, signed the deal with the head of Russia’s state nuclear corporation, Rosatom, Sergei Kiriyenko, on the last full day of Vladimir Putin’s presidency. Burns’ last official act as Ambassador will be to attend the pomp and circumstance of Medvedev’s assumption of the Russia Presidency today. "The United States and Russia were once nuclear rivals – we are today nuclear partners," said Burns at the signing ceremony, news agencies reported. At the 2006 Group of Eight summit in St Petersburg, US President George Bush and Putin ordered ministers to reach a deal but it has faced opposition from some US congressmen because of Russia’s nuclear cooperation with Iran in the building of the Bushehr reactor on the Persian Gulf. This resistance still remains in Washington, even though the administration itself has toned down its anti-Iran rhetoric by several decibels in recent days. A 123 agreement – so-called because it falls under section 123 of the US Atomic Energy Act – is required before countries can cooperate on nuclear materials. At a summit last month in Sochi, Russia, Bush and Putin agreed to ink the nuclear cooperation deal that was signed Tuesday. The Bush administration is now going through the US interagency process leading to the president’s signature. The deal is critical to the Global Nuclear Energy Partnership, or GNEP, which the United States and Russia have discussed for more than a year as a way to expand peaceful nuclear energy development and mitigate proliferation risks. Yet, some US politicians have said nuclear cooperation with Russia should be avoided because Moscow ‘s involvement with Iran’s nuclear programme. But the Bush administration is keen to have the pact approved this year. US State Department spokesman Sean McCormack said in Washington that now that the deal has been signed, it would be sent to Congress for lawmakers to review "in due course," Reuters reported. When asked about speculation that Bush may not submit the deal to Congress – possibly leaving it for the next president to deal with – McCormack said, "Usually we don’t sign agreements we don’t intend to send to Congress for ratification" according to briefing notes posted on the State Department’s website Tuesday. Once the agreement is sent to US lawmakers, it would go into force if Congress did not pass a disapproval resolution within 90 legislative days. Russia’s parliament, the State Duma, controlled by Putin’s party, must also ratify the treaty. According to observers, with Putin taking the reins as Russia’s new Prime Minister, there is little doubt the accord will pass the Duma. "The signing of this agreement opens a gigantic field of opportunities for the economic cooperation in the large and growing businesses linked to the civilian use of nuclear energy," Kiriyenko said after the signing. "What this agreement allows us to do is to implement some very creative ideas that both Russia and the United States have put forward to deal with the growing challenge of proliferation of nuclear weapons," Burns told reporters ahead of Tuesday’s signing of the pact. He said the deal will allow Washington and Moscow to move forward on proposals for international nuclear fuel centres, which would sell developing countries access to nuclear energy but remove the need for their own enrichment programmes. This was a specific reference to the much-vaunted International Uranium Enrichment Centre slated for construction in Angarsk, near the precious natural resource of Lake Baikal in southeastern Siberia, a notion warmly endorsed by US Congress in June 2007 as a way to reign in Iran’s ever increasing pursuit of enriching more uranium. Congress pledged $50 million toward the siting and constructing of the uranium bank as a matching grant posted by the Washington-based non-proliferation NGO, the Nuclear Threat Initiative, who received the money from American Tycoon Warren Buffet. Norway has also posted $5 million toward the uranium bank and has pledged to spearhead the effort to raise the remaining estimated $100 million required to realise the project. The centre, said the State Department at the time, would hinder sales of uranium fuel to rogue nations, specifically Iran, but Kiriyenko and First Deputy Prime Minister Sergei Ivanov have since made clear will be open to all comers. The International Uranium Enrichment Centre, while apparently affording some proliferation controls, could be a harbinger of environmental disaster in the area, say environmentalists. The Centre’s location less than 100 kilometres from Lake Baikal and 30 kilometres from the Siberian city of Irkutsk will inevitably impose yet more nuclear woes for Russia. As Russia will produce uranium fuel for a number of nations, so, too, will it be obligated to reclaim the spent nuclear fuel once it is burned in foreign reactors – especially for those countries that have little to no nuclear storage space of their own. At present, no satisfactory long-term storage scheme for storing spent nuclear fuel has been developed by any country. This is especially pressing for Russia, which has upwards of 15,000 tons of spent nuclear fuel in interim storage. This is a problem that US officials acknowledged in interviews have said is of secondary consideration to them. “The United States has endorsed the centre to minimise nuclear proliferation risks,” said a State Department official who asked not to be named because he is not allowed to discuss the subject publicly. “It is hoped that the Russians can deal with any associated environmental risks – we are backing this as a political solution to undesirable proliferation. Bellona’s Alexander Nikitin has pointed out the contradiction inherent in the Russian plan to consolidate proliferation risks in one area while boosting them in another. 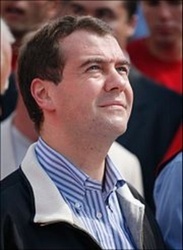 He referred primarily to Rosatom’s plans to build floating nuclear power plants. Tuesday’s agreement simplifies life for companies in both countries and allows them to strike deals on trade in nuclear materials directly among themselves. Putin has reformed Russia’s nuclear sector to boost competition and open it up to nuclear firms such as Japan’s Toshiba, which owns U.S.-based Westinghouse Electric. Medvedev’s pro-business rhetoric in what little of a campaign he conducted in the absence of any challengers, who were openly denied access to Russian media, is not expected to differ from that of his mentor former KGB mentor. Under Putin, Russia has crafted a nuclear behemoth under the aegis of Rosatom called Atomenergoprom – which officials say is a nuclear version of Russia’s gas giant Gazprom, which is not afraid to withhold sales to exert political pressure – to compete with the biggest nuclear companies on the world market. US Congress pledges $50m to international uranium fuel bank – but what will this cost Russia’s environment?